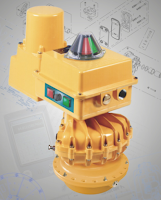 A hydraulic gear pump immersed in its own reservoir delivers pressurized oil to the vane-type 90° actuator via the control box, which contains non-return valves and solenoid valves to direct the flow into the actuator; with cam operated limit switches to control travel and (optionally) signal position to the user. The unpressurized side of the actuator is connected to the reservoir, so there is no net transfer of oil from reservoir to actuator. The pump and its motor run entirely on precision ball bearings, so that the friction and motor size can be minimized and life maximized; the efficiency resulting from this reduces the heating effect and allows 100% rating. A pressure release valve is built into the pump so that if the actuator load becomes jammed the torque is limited and dangerous over pressures or motor stalls are avoided. Fail-safe spring return action uses a reliable low-stress-range sealed clock-type spring unit mounted coaxially with the actuator, together with a fail-open solenoid valve, to ensure reliable positioning when power is not supplied to the unit. A high flow external dump valve can be fitted to allow very rapid spring-driven action. Double-acting models are supplied with solenoids arranged to give position locking when power is disconnected. An optional manual by- pass valve is available to allow manual override movement of a double acting when power is disconnected. The interface between pump/reservoir unit and the control box allows mounting of the pump in different orientations at 90° to each other, so that the motor can be kept above the reservoir whether the actuator output axis is horizontal or vertical. External electrical connections are all made via a single accessible connector block in the control box, with the simplest possible switching needed to drive the unit. Two conduit entries are available, to allow easy separate connection of power and signal lines (if used). All internal wiring is connected via a central connector and fuse board, and the actuator is protected from supply surges by a metal oxide varistor suppressor.